Spending forty hours (more, if you count the occasional overtime) in the office, you are likely to get caught up into the craziness of the work place. While this is entirely expected, it’s when things escalate that can truly derail you from doing your work well. When the “craziness” becomes a full-blown cattiness, knowing how to deal with the ensuing drama will help you keep your sanity and best of all, your job. There is nothing more complicated than dealing with your own negative feelings about the work you do and the company you work for. If you go to work every day complaining about everything, from the long hours, the unscheduled overtime, and even about the people you work with, co-workers are likely to label you negatively and this can significantly decrease your chances or getting promoted, or worse regularized. Don’t let your negativity weigh down people in your office. If you think you are no longer happy about your work, it is better to resign than pass your ill feelings to others. If resigning is not an option, then ask yourself what about your job like and don’t like doing. Once you figure out the root of your negative feelings, detox by focusing on the things that make you happy and consciously remind yourself about it every time you feel the negativity creeping in. The more effort you put into doing so, the higher your chances of eliminating your negative attitude. Keep a positive outlook. Positivity, after all, (as numerous experiments by Positive Psychology researchers Martin Seligman and Mihaly Csikszentmihalyi have shown) is a skill that can be learned. For more on Positive Psychology in the workplace read Happiness at Work by Srikumar Rao. Office gossips are a staple in any work environment. Everyone wants to be part of the latest juicy scoop, everyone except the person being talked about. It is always a good idea to disassociate yourself with people known to spread office rumors, as they won’t do any good for your career. Remember that if they can talk about other people with you, what’s to stop them from talking about you to other people too? Being branded as part of the office rumor millers is the last thing you would want yourself drag into. If co-workers start badmouthing or maligning people, politely excuse yourself from the conversation or try to steer the topic into something more productive. If they insist on telling you about the latest scoop, come up with something to avoid being part of the nasty talk. Nothing can be more draining than working with a colleague who is a big ball of negativity. When all you hear is from them is whine, whine, and whine, it is time to start thinking of moving away from them, as far away from these people as you can. Negative co-workers can steadily zap all your positivity and enthusiasm. Their attitude is most likely to rub off you and before you know it, you will start feeling the same way about work too. You have two ways to address the situation. You can either talk to them about it, or you can choose to ignore their attitude and keep your distance. The latter is easier to do but the former will require a bit of careful maneuvering. If you decide to talk to them about it, try to pick a good time like when you’re all out chilling away from work. It is difficult for people to be told that they have negative behavior and it takes a big heart and an equally bigger mind to own up to being negative. If you are lucky, you just might help them see their problems, if not, you can console yourself with the fact that at least you tried. 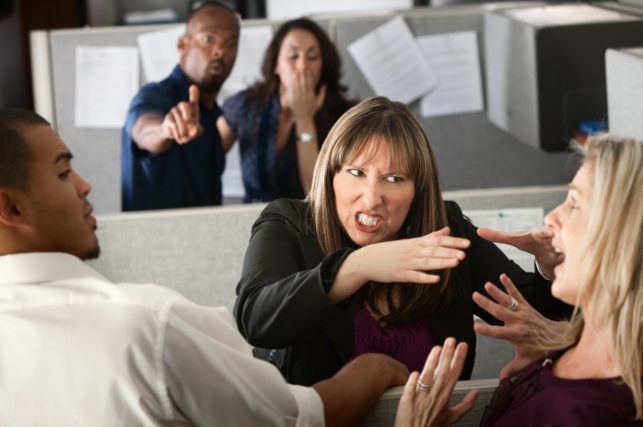 Angry and negative co-workers share something in common, neither will do you any good. The only difference is that an angry co-worker is quick to act violently. Whether it’s because they feel that you have it easy or that they have been passed up for promotion because of you, it’s best to carefully think about your actions when confronted by them. Don’t add fuel to the fire by retorting in anger. Try to diffuse the situation by keeping both your tongue and your emotions in check. Your best course of action is to listen to them talk about their frustrations. Let them vent and do your best to remain calm and collected but be watchful in case they begin to consider you as their de facto counsellor. It’s best to ask help from your Human Resource Department to mediate should the situation worsen. You won’t get anything from being upset with them so be the better person and walk away.